Guess non interesting is the name. Hi Jim - I assumed you did a search in the ads data base? Did you find any matches? Stamford case, but with engraving on the bezel uprights. Seen before, but no matching ad. Stamford and Alderman in red gold case have 17 jewels. Case SN gives a date of 1946. Edit- Possibly the Aviator "B", correct case/dial/hands/jewel count, just not enough detail to show any engraving. Although, looking at the lug tips,t does look a little like engraving, especially to the top right lug. Can be seen a little better when magnified. Thanks Bob will update year. I looked through both ad db's as well and was surprised to see it - sans engraving - as a couple different names but nothing with the engraving. Unknown (for now), looks to be in excellent condition for it's age. I looked everywhere, I have nada. Why are the lugs on the right side of the picture of the Aviator "B", which are in the light, not shiny like a plain lug should be? Answer: They are engraved, that's why! 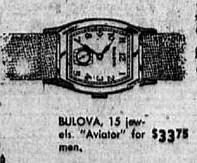 The ad is a mat picture of an actual watch, not a drawing, we can see the left side is in shadow, so the right lugs should look "plain" if they are plain. 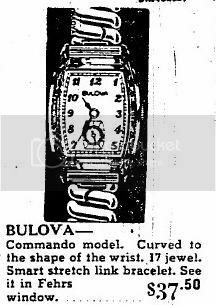 Here is another ad for the same watch, this pic is taken from directly above. Why are the lugs not shiny like the bezel? Here is and ad for the yellow gold Stamford, same case. Shiny plain lugs. 17 jewels. Look at the Navigator on it's right. engraved lugs and bezel, dull. Same kind of thing going on here. So it's not a movement change, same 10BC. The Aviator ads are from 1948 top, 1946, bottom. Aviator looks to be a match to me. Anyone seeing it?